I think I’ve officially reached food nerd status by how excited I have been to share this cake with you all. It’s incredible. Dare I say it–it’s on the same level as my Mom’s ridiculously amazing German Chocolate Cake. The recipe is inspired by this coconut cake from A Bountiful Kitchen. I added a cream cheese buttercream frosting instead, and used the leftover coconut milk from the cake to give the frosting a little extra creaminess, with just a milk hint of coconut flavor. 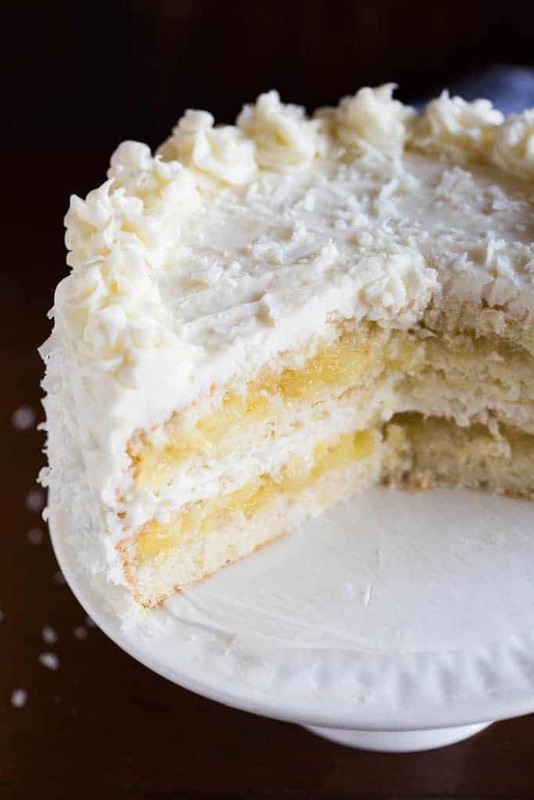 This recipe starts with a simple homemade coconut cake made with egg whites for texture and color, coconut milk and coconut extract to give it that perfect coconut flavor, that’s not overwhelming at all. 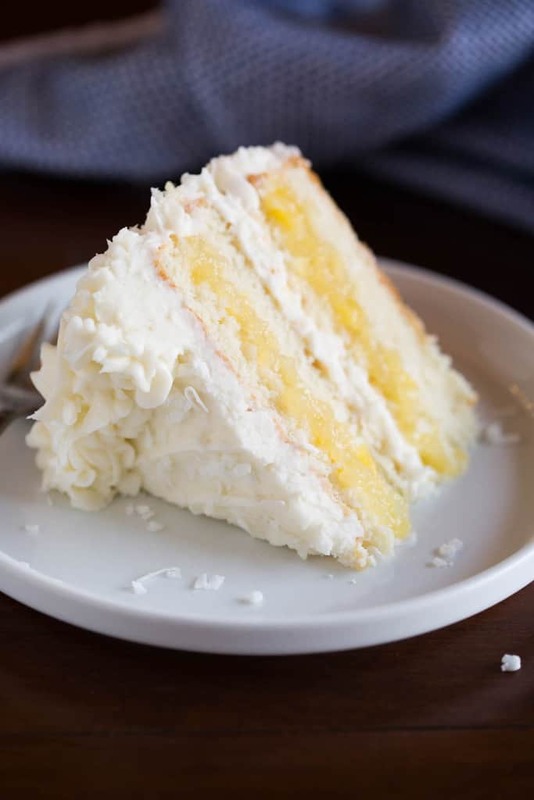 The cake is incredibly moist (I hate that word, but it must be used here), not overly sweet, which I really love because it blends so well with the flavors from the pineapple filling and frosting, without any one element being too sweet. Can you get a better flavor combination then coconut and pineapple? This cake is completely DREAMY! Also, when you make each part in advance, it’s really a simple and fun recipe! 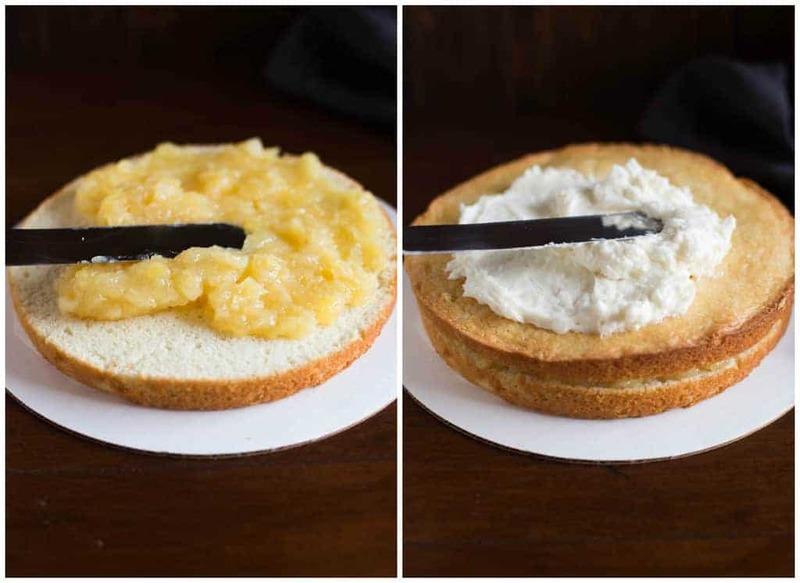 Once you’ve made the cake, you will “torte” each layer — that’s a fancy name for cutting each cake layer in half, horizontally to split it into two layers. 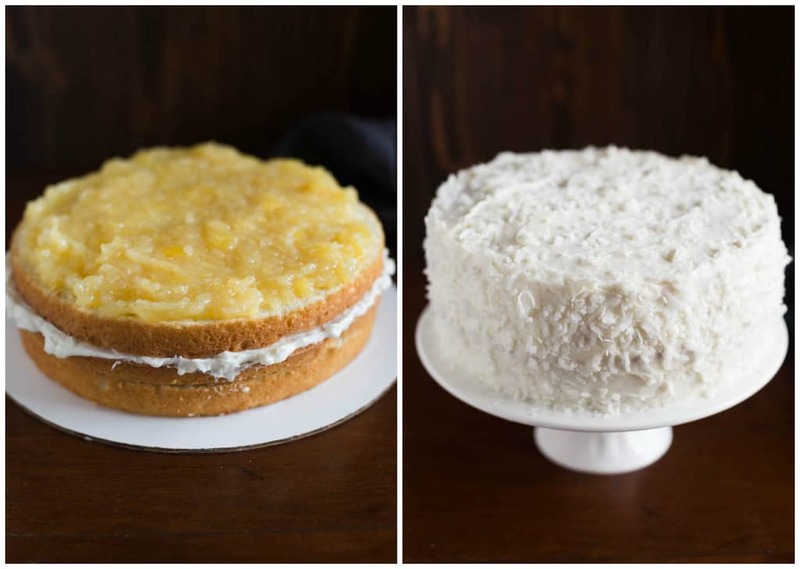 This allows us to add layers of pineapple filling and frosting, between each cake layer. Assembly is really easy. Once you’ve got your 4 thin layers of cake, place one of them on a cake board or your serving platter. Spread half of the pineapple filling over it. Top with another cake layer. Smooth a layer of coconut frosting over it. Top with the third cake layer. Spread remaining half of the pineapple filling over it. Top with last (4th) cake layer. Frost the sides and top of the cake with the frosting. Sprinkle with a little bit of extra shredded coconut, if desired. When your friends or family are raving about this cake with every single bite, I hope you feel like a rockstar! And, I hope you’ll take a moment to tell me about it in the comments! I like to make the cake, pineapple filling, and coconut cream cheese frosting at least one day in advance. That way, the cake is really easy to throw together. I make the cake in 8” or 9” rounds, bake it and let it cool completely. Then I wrap it really well in plastic wrap and stick each layer in a ziplock freezer bag. Freeze for up to one month. I’ve found that frozen cakes are the easiest to frost. The pineapple filling and coconut frosting can be made ahead and placed in a covered container in the fridge. 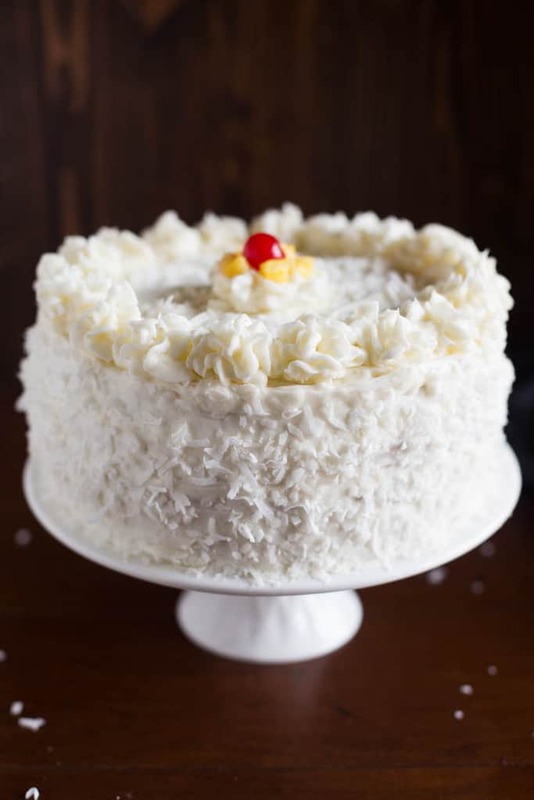 Remove the coconut frosting from the fridge about an hour or so before you’re ready to frost your cake. This will allow it to come to room temperature. I used a wilton 2D tip for the swirls on top of this cake. SO EASY. I also love the Wilton 1M tip. I use both tips with an Ateco flex 14” reusable piping bag. Those three items right there are my favorites for cake and cupcake decorating. STORE IT COVERED, IN THE FRIDGE. This is one of those cakes that really tastes better after it’s been in the fridge for at least 4 hours. It allows the flavors and texture time to settle and blend together. I think it even tastes better on day two. Line the bottom of two 8 or 9-inch cake pans with wax or parchment paper. In mixing bowl, whisk together flour, baking powder and salt. Set aside. In a separate mixing bowl, beat the butter on medium speed (with hand or stand mixer) for 1 minute, until light and fluffy. Add 1 1/4 cups coconut milk and coconut extract and mix. Gradually add flour mixture and mix on medium speed for 2 minutes. Fold the egg whites into the batter until incorporated. Spray the bottom and sides of the lined cake pans with non-stick cooking spray. Divide batter evenly between the pans. Bake at 350 degrees F 23-28 minutes, or until a toothpick inserted in the center of the cake comes out clean. Remove the pans from the oven and allow to cool for 5 minutes before inverting them onto a cooling rack to cool completely. Once cakes have cooled, use a sharp serrated knife cut each cake round in half horizontally, so that you end up with four cake rounds. At this point I like to freeze the cakes for several hours or up to 3 weeks. They're much easier to assemble and frost when they are frozen. But, you can assemble them fresh, the day of. Pour filling into a tupperware. Place a piece of plastic wrap gently over the top and allow it to cool. Once cooled, cover it with an airtight lid and refrigerate until you're ready to use it (up to 1 week). Add powdered sugar and the rest of the remaining coconut milk (or regular milk). Mix until smooth and fluffy, about 3 minutes. Stir in coconut flakes, saving some for sprinkling on the sides and top of the cake, if desired. Place your first cake layer on your cake board or serving platter. Spread half of the pineapple filling over it. Top with third cake layer. Spread remaining half of the pineapple filling over it. Top with last (4th) cake round. Frost the sides and top of the cake. Sprinkle with coconut, if desired. Refrigerate for at least 4 hours, before serving. Tastes even better the next day! If you love to bake, try my German Chocolate Cake! *See my notes above the recipe for tips for making this cake in advance! This cake was amazing! I made it as a birthday cake for a co-worker and everyone loved it! Thank you for this recipe. I will absolutely be making this again! 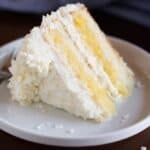 This cake is awesome… I love pineapple cake and pie… But this cake was easy to make and harder to put the fork down from eating this cake….. The cake tastes great. Although I had some hiccups with the egg whites and the cake didn’t rise enough to cut them both in half, it was still delicious! i made 4 bc i couldn’t cut in half. Delicious. This cake was delicious and I love both coconut and pineapple. This is the first homemade cake I have ever made, so it didn’t rise like it should have. So it was a 2 layer cake instead of 4. Still everyone loved it..Going to have to try again. Thanks for the recipe. OMG not fair putting all these pics and video up.. I have nothing to make this with right now and am already in my jammies… This looks so luscious.. I can’t wait to make it.. It looks really easy as well. Thanks for posting it and making me drool! I wanted to ale this delicious looking cake for Easter, but I see the time to make over 4 hours wow. I know it’s not the same as from scratch but could you use white cake box mix and add coconut extract then do the frosting and filling the same as directed? just curious? Hi Anne–yes, it takes a bit of time, that’s why I always make the different elements (cake, frostings), a day or two ahead of time. Yes, you could substitute a white cake mix with a little coconut extract in it and it would still be delicious. Enjoy! I’d have to know the volume of the cake pan– your best bet would be to double the recipe, use the batter to fill the pan and any excess batter could make cupcakes. So for Easter my mom asked me to make a cake, and I have only ever baked one cake from scratch. This recipe was perfect and had everybody thinking I was doing this forever! Dont get me wrong it was ugly (I lack the frosting skills) but so far as taste, people are still talking about it. Even those that say they dont like coconut was impressed by how moist and perfect this cake was. I’m such a beginner with baking that I had to YouTube what “stiff peaks” meant for the egg whites. So if I can do it, anybody can. Great recipe! That is fantastic :). I’m so glad this cake was a success for you! I hope it’s a new Easter tradition :).